Hedge fund managers like David Einhorn, Dan Loeb, or Carl Icahn became billionaires through reaping large profits for their investors, which is why piggybacking their stock picks may provide us with significant returns as well. Many hedge funds, like Paul Singer’s Elliott Management, are pretty secretive, but we can still get some insights by analyzing their quarterly 13F filings. One of the most fertile grounds for large abnormal returns is hedge funds’ most popular small-cap picks, which are not so widely followed and often trade at a discount to their intrinsic value. In this article, we will check out hedge fund activity in another small-cap stock: S&P Global Inc. (NYSE:SPGI). Is S&P Global Inc. (NYSE: SPGI) the right investment to pursue these days? The best stock pickers are taking a bullish view. The number of long hedge fund bets advanced by 5 lately. 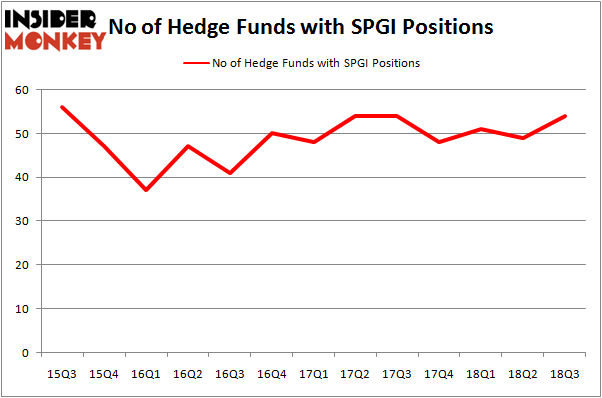 Our calculations also showed that SPGI isn’t among the 30 most popular stocks among hedge funds. According to most traders, hedge funds are assumed to be unimportant, old investment tools of years past. While there are more than 8000 funds in operation today, We look at the crème de la crème of this club, around 700 funds. These money managers oversee most of the smart money’s total asset base, and by shadowing their matchless picks, Insider Monkey has come up with various investment strategies that have historically exceeded the S&P 500 index. Insider Monkey’s flagship hedge fund strategy defeated the S&P 500 index by 6 percentage points per year since its inception in May 2014 through early November 2018. We were able to generate large returns even by identifying short candidates. Our portfolio of short stocks lost 24% since February 2017 (through December 3rd) even though the market was up nearly 23% during the same period. We just shared a list of 11 short targets in our latest quarterly update. What have hedge funds been doing with S&P Global Inc. (NYSE:SPGI)? Heading into the fourth quarter of 2018, a total of 54 of the hedge funds tracked by Insider Monkey held long positions in this stock, a change of 10% from the previous quarter. By comparison, 48 hedge funds held shares or bullish call options in SPGI heading into this year. With hedgies’ capital changing hands, there exists an “upper tier” of notable hedge fund managers who were boosting their holdings significantly (or already accumulated large positions). 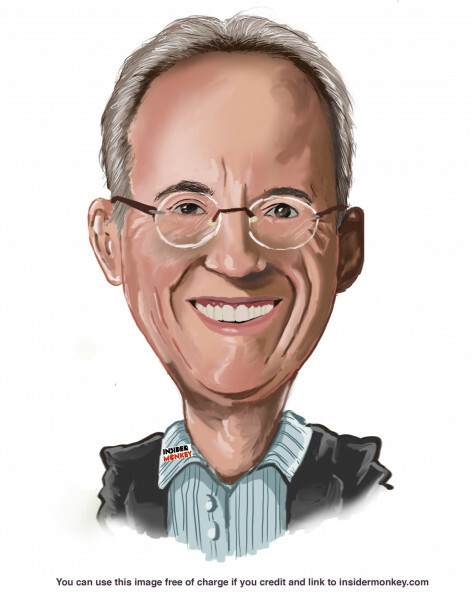 When looking at the institutional investors followed by Insider Monkey, John Armitage’s Egerton Capital Limited has the number one position in S&P Global Inc. (NYSE:SPGI), worth close to $618.5 million, comprising 4.6% of its total 13F portfolio. Sitting at the No. 2 spot is Cantillon Capital Management, managed by William von Mueffling, which holds a $562.4 million position; 6.3% of its 13F portfolio is allocated to the company. Remaining hedge funds and institutional investors with similar optimism comprise D. E. Shaw’s D E Shaw and Jim Simons’s Renaissance Technologies. As aggregate interest increased, some big names have been driving this bullishness. Incline Global Management, managed by Jeff Lignelli, assembled the biggest call position in S&P Global Inc. (NYSE:SPGI). Incline Global Management had $17.5 million invested in the company at the end of the quarter. Matthew Tewksbury’s Stevens Capital Management also initiated a $14.4 million position during the quarter. The other funds with brand new SPGI positions are Steve Cohen’s Point72 Asset Management, Brad Dunkley and Blair Levinsky’s Waratah Capital Advisors, and Paul Tudor Jones’ Tudor Investment Corp.
Let’s also examine hedge fund activity in other stocks similar to S&P Global Inc. (NYSE:SPGI). We will take a look at Valero Energy Corporation (NYSE:VLO), Deere & Company (NYSE:DE), HCA Healthcare Inc (NYSE:HCA), and Emerson Electric Co. (NYSE:EMR). This group of stocks’ market valuations resembles SPGI’s market valuation. As you can see these stocks had an average of 37.25 hedge funds with bullish positions and the average amount invested in these stocks was $2.02 billion. That figure was $3.926 billion in SPGI’s case. HCA Healthcare Inc (NYSE:HCA) is the most popular stock in this table. On the other hand, Emerson Electric Co. (NYSE:EMR) is the least popular one with only 32 bullish hedge fund positions. Compared to these stocks S&P Global Inc. (NYSE:SPGI) is more popular among hedge funds. Considering that hedge funds are fond of this stock in relation to its market cap peers, it may be a good idea to analyze it in detail and potentially include it in your portfolio. HMI Capital’s Returns, AUM and Holdings Here is What Hedge Funds Think About Movado Group, Inc (MOV) Is MGM Resorts International (MGM) A Good Stock To Buy? Simcoe Capital Management’s Returns, AUM and Holdings Billionaire Leon Cooperman’s New Stock Picks Is Mohawk Industries, Inc. (MHK) Going to Burn These Hedge Funds?